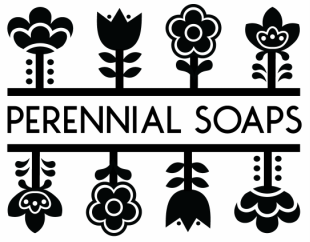 Perennial Soaps is a soap company located in Downtown Racine, Wisconsin. We operate Perennial Handmade Studio, a retail store front offering our full bath & body product line as well as various handmade gifts and products from around the Midwest. Our products include bar soap, foaming liquid soap, lip balm, roll on perfume, body/room mist, tattoo balm, bath bombs and bio plastic soap dishes. Our products are made from scratch, and are 100% vegan and palm oil free. ​Established in 2011, Erin of Perennial Soaps began making soap due to a lack of natural, vegan bath & body products in her home town. She formulated a plant based recipe from scratch, free of destructive palm oil and unnecessary chemicals. The recipes begin with fresh, plant based ingredients like organic cocoa butter and fair trade shea. Premium grade essential and fragrance oils are added to produce unexpected scent combinations like Wanderlust, No Coast and our best seller, Urban Hippie. Topped off with fresh botanicals like locally grown lavender and calendula, the soaps are cut into generous 5 ounce bars and labeled with ingredients. Free of parabens, detergents and unnecessary chemicals, most of our products have less than 9 ingredients. Certified cruelty free by PETA and Leaping Bunny, our products are tested on friends – not animals. We enjoy selling at indie handmade shows and veg fests throughout the Midwest and love to see our repeat customers!